The all-new Guitar Hero. One game. Two ways to play. 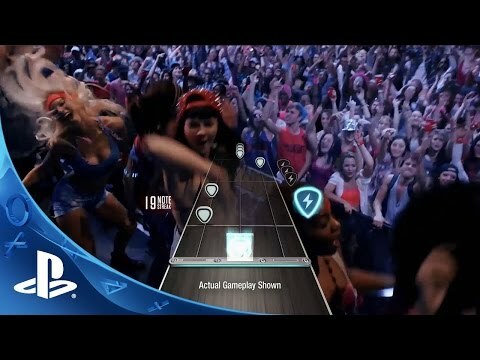 GH Live lets you rock real crowds with real reactions. And the second mode, GHTV, is the world's first playable music video network with a library of hundreds of music videos you can play. Guitar Hero Live. It's about to get real™. Turning on GHTV is similar to turning on your regular TV. Pick a channel and dive right in. Don’t like what’s on? Just switch over to another channel and pop into a new song. GHTV makes it more fun to play with your friends than ever. While one person is playing, everyone else can watch the videos. Plus, GHTV doubles as a competition. Compete in the living room or online. Or, check out the global leaderboard, and see how you stack up against fellow rock stars around the world. Activision makes no guarantees regarding the availability of online play or features, including without limitation GHTV, and may modify or discontinue online services in its discretion without notice. © 2015 Activision Publishing, Inc. ACTIVISION, FREESTYLEGAMES, GH and GUITAR HERO are trademarks of Activision Publishing, Inc.